bentleyuser.org - Bentley iPad apps due this summer. Bentley iPad apps due this summer. 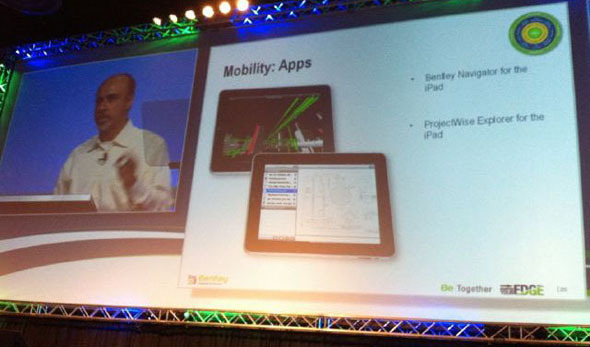 Bentley demonstrated iPad apps for ProjectWise Explorer and Bentley Navigator at BE Together 2011. Using the i-model container these apps will enable the iPad to view data stored in ProjectWise systems in a wide range of formats. The apps are expected to be available from the Apple App Store during August. Android and other platorms will be supported in due course. A particularly juicy feature of the Navigator app is Panoramic Navigation that enables users to navigate models by simply moving an iPad as though it were a window into the model within which they are virtually immersed.